So I decided to do the most simple project imaginable: retrofitting the Defusable Alarm Clock with normally-closed tactile buttons rather than dealing with the "it looks like a bomb" wiring. My son put it together, but we quickly found out that wires and screw terminals are something of a pain if you aren't willing to do the "cut-the-wire" method to stop the alarm. So I made a sidebar board that will run the wires from the screw terminals to four surface-mount tactical buttons. Simple right? Was looking that way. The ink laid down nice and smooth, and the SMD pads were looking pretty flat. I had kept the ink at room temperature for longer than usual and thought that maybe my earlier woes were due to ink that was too viscous. So are we ever going to get sufficiently flat pads that dodges this keystoning problem? For the moment it looks like adhesion is going to be ok on these buttons, but I've definitely had dimpled pads that made adhesion very weak. The dimples in pads are a consequence of the dispensing process and the adhesion of ink to the nozzle. They are formed when the nozzle pulls away from a finished pad, causing a small amount of ink to follow the motion of the nozzle for a short distance. We've tried out a number of methods in the past of smoothing out the dimples with different approaches (pulling gradually, in different directions, gradually reducing flow rate, etc.) but found that our approaches would either just move the dimple to another part of the pad (like a corner), or potentially impact either the infill of the pad or features closeby. There are some ways of mitigating how pronounced the dimples are, though - reducing the print height to 0.6-0.8mm generally leaves a smoother finish, and burnishing will also smooth out the dimple. 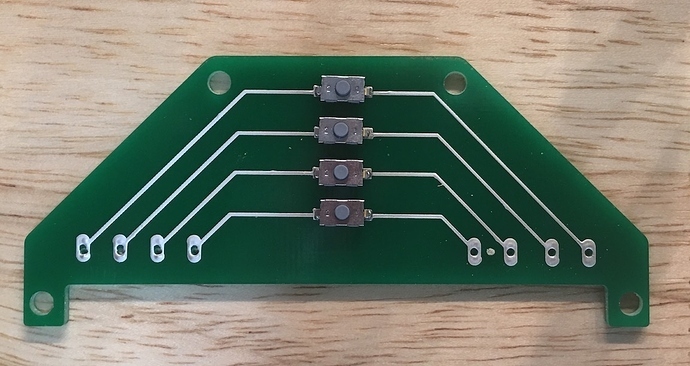 Also, touching up the component with the new solder will help produce a stronger joint, and allows you to adjust the orientation (just apply flux, add solder, and adjust component position, then hold in place until it cools). We know that the little 'dimple' in the ink isn't ideal for some applications, but hopefully these suggestions will help with future projects. I hear ya, I was just curious as to the state of the R&D on that. Just a crazy thought: I don't supposed you've looked into the possibility that having the ink suspended upside-down during baking amplifies the effect? Gravity would in that case appear to be working against the ink being flat. Also, as you pointed out, different toolpaths just move the dimple around. Any thoughts of running with that? In my case, almost all of the time it's been a liability for the dimple to be in the center of the pad. Whereas having it on an outside corner (and/or where the trace meets the pad) might have a lesser impact. For example, last fall I had a heck of a time with a prototype that had SMD LED's, which would keystone horribly as they had to balance on the dimples. This was causing aesthetic as well as adhesion issues. The irony being that the pad on the LED had a semi-circular cutout on the outside edge, which would have meant that a dimple at the joint between the pad and trace would have at worst had the dimple placed inside or just beyond the cutout. For sure, and thanks for the feedback! Hearing from our users is how we find out what's working and what isn't, which in turn affects how we prioritize our development. Going back to the approach of terminating a print in the outside edge or trace connection of a pad is something we could test out, though I'm not sure when we'll be able to give it a shot - I'll let our SW team know so they can check it out when possible (paging @troy to keep him in the loop). We looked into right-side up curing a while back to test the difference in curing quality, but we didn't check whether there was any effect on the board texture. We have seen in the past that face-up baking can lead to poorer curing quality, since the ink is exposed to environment and temperature of the ink is lower while baking. If you happen to give this a shot though, let me know how it goes! re: curing. Don't know when I'd get to this (I'd have to change the firmware in my DIY reflow oven to account for the much longer soak time), but what I was envisioning was trying right-side-up baking in a reflow oven, which would lessen the impact of the ink facing away from the heat source. I suspect it doesn't matter much, unless the temperatures on the way to and including the soak temperature has an impact on the viscosity. That could possibly promote a slight downward droop, exaggerating the dimple. If you can set the reflow oven to maintain between 190-210C for the entire curing cycle, that would be ideal, and I'd expect you to see good curing quality. Ramping rate isn't particularly critical from our experiments, but faster is better to minimize your curing time. The key factor is maintaining accurate and consistent temperature, since even a 10C difference can affect curing quality to some extent. I would like to throw my support towards having the dimple where the trace meets the pad. Did this ever happen or at least a configurable option? Also any suggestions on how to make the pad as flat as possible would be appreciated.